It happens that most of the times when we try to share our link at Facebook the thumbnail never appears and it gets really frustrating for all of us who are active bloggers and share a good part at internet. 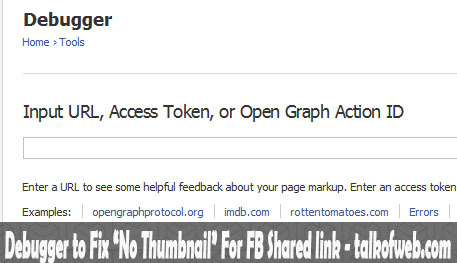 I found a solution to cop with this problem and you will be able to make the Facebook shared link thumbnail immediately as soon as you follow the solution step wise with you precious link. The difficulty level is just 0% and its a simple trick which can save a lot of heck. 1- First Copy the link which you want to be shown with thumbnail preview at the Facebook. 2- Go to the Debug tools at the Facebook Developer and paste the link to analyze that what kind of meta data Facebook server can fetch. 3- If you get the thumbnails in your result related to that pasted link, then the open graphs tags are successfully used with your post or any other online content. 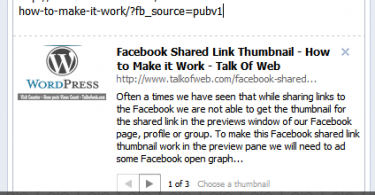 In case you don’t see any thumbnails then you need to read this post: Facebook Shared link Thumbnail – How to make it work After reading this thoroughly and after following the guideline, Again repeat the process and this time you should be able to see your desired thumbnail in the Debug tools for Facebook. 4- Go to the place, Fanpage or group at the Facebook where you need the specific link to be shared with thumbnail preview and this time thumbnail will show up. All the process taken in the debugger tool made Facebook recognize the thumbnails attached with our post and now sharing it anywhere won’t give you any blank thumbnail error. I am following your guide but I can’t seem to make it work for what I want to share at Facebook. I am sharing this link below. When I share this at facebook there are three pictures to choose from. 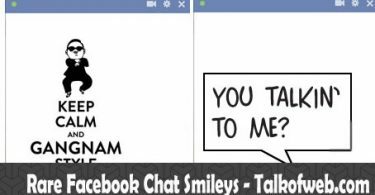 But what I want to show is this picture from the link when I share at facebook. Is there a way to make it that way? I am that guy Markel Robregado from the image link. I’ll create a post on this to help you out, stay tuned. I’ll provide you link once post is ready. Thankyou!